Microsoft unveiled their new search engine Bing, last week with considerable fanfare. Thanks to Google’s Wave announcement the same day it probably didn’t get as much press coverage as it deserved. 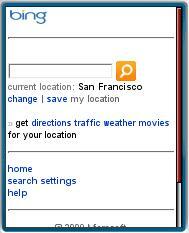 Bing replaces Live Search and MSN Search. Initial reviews have been quite positive. Billed as a “Decision Engine”, Bing on the desktop has some nice touches including auto completion of queries, a list of related searches in the left sidebar and infinitely scrolling results rather than pagination for image searches. Bing also does a nice job with shopping searches, presenting results in a grid similar to price comparison sites like Price Grabber. There’s one-click integration with Bing (formerly Live) Cashback which gives discounts on products purchased through the site. Results can be filtered by brand and price and sorted by price, shipping cost and cashback percentage. The relevance of search result’s is pretty good too, I didn’t get any of the wacky off-topic results that used to plague MS Live search. Bing is a real improvement over Microsoft’s previous search products. I generally found Live .com to be inferior to both Google and Yahoo search. With Bing, I think Microsoft has leaped past Yahoo to rival Google in both relevance and features. But that’s on the desktop. What about the mobile version of Bing (m.bing.com)? Frankly I was disappointed by mobile Bing. The good news is that the improved relevance seems to carry over to the mobile version. The related search feature also made it to mobile and works well. 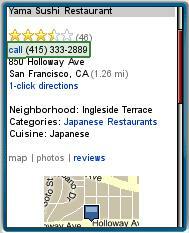 Bing’s local search, which was one of Live Mobile’s strong points, has click to call numbers, user reviews, good maps and directions. It’s one of the best ways to find nearby shops and attractions with your phone. But product search on mobile is full of problems. Results can be filtered by price and brand but can’t be sorted and the default sort seems to be random. For some products there is a “From $N.NN” link which, when it works, brings up a list of vendors for that product sorted by price. However, the price link often brought up the message “You’re trying to perform a search that isn’t supported in your country. Please try a different search.” or displayed an XML parsing error in Opera Mini and Firefox. Clicking a vendor name link, which looks like it might let you make a purchase, invariably failed with a variety of different error messages. The worst thing about Bing mobile is that it seems to be almost completely unaware of the existence of mobile optimized web sites. Mobile sites are getting indexed and do occasionally occur in the results, usually buried a page or two down. But they aren’t consistently flagged as mobile and following a link to a mobile site often opens it in the Infogin transcoder rather directly. 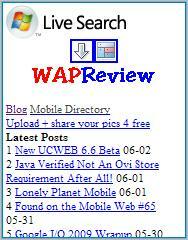 For example, a search for “wapreview” returns a transcoded version of wapreview.com as its top result. Wapreview.mobi appears as the ninth result and also opens in the transcoder. This is in spite of wapreview.com having a <link rel=’alternate‘ media=’handheld‘ …> meta tag pointing at wapreview.mobi. That meta tag is the defacto standard for telling search engines about the presence and location of mobile specific content. The reformatting of wapreview.mobi is both unnecessary and ugly. According to both Wurfl’s “Rules for Responsible Reformatting” and the W3C’s Content Transformation Guidelines, wapreview.mobi should not have been transcoded as it’s 1) a .mobi domain, 2) is written in xhtml-mp and 3) is sent with a Cache-Control no-transform header. Any one of which alone should tell a compliant transcoder to leave the site alone. It is possible to turn off the transcoder on Bing Mobile’s Settings page and there is a link to the original at the bottom of each transcoded page but the default is for the transcoder to be on. It’s not just WapReview that gets its mobile site buried or broken by Bing Mobile. It also happens to CBS News, Google News, The Huffington Post, Gizmodo, Sports Illustrated, Slashdot and countless other sites that have mobile versions. These publisher’s mobile sites aren’t easily discoverable with Bing and when they do appear in results they are bowdlerized by unnecessary transcoding. In contrast both Google and Yahoo’s mobile searches are much more mobile aware with the option to filter results to mobile web only and with obvious mobile content rarely if ever transcoded. I certainly hope compliance with mobile search and transcoding standards was something that broke in the rush to release Ping rather than by design. I know that the Infogin transcoder has heuristics based the Responsible Reformatting and W3C criteria to detect mobile sites and pass them through unaltered but it appears that the heuristics are either disabled or not working properly. The mobile discoverability problem will probably be harder for Microsoft to fix the inappropriate transcoding of mobile sites. The Bing crawler needs detect and follow link rel=’alternate‘ media=’handheld‘ meta tags and do a better job of recognizing mobile formatted content and tagging it as such. Eventually I’d like to see Bing add a “mobile web” category or filter for search results like Yahoo and Google do. Transcoding is a crutch that should be reserved for content that is not published in a mobile optimized form. This entry was posted in Content Adaptation, Microsoft and tagged Bing, mobile content transformation, mobile site review, Search by Dennis Bournique. Bookmark the permalink. Note that on Verizon Wireless (where Microsoft/bing is of course the default search partner) Content Transformation of the bing search results is performed by Verizon’s CT partner (Novarra) rather than MicroSoft’s current default provider (InfoGin). Unlike the InfoGin service for Microsoft, Novarra’s service correctly follows the meta tag. So a Verizon Wireless customer who chooses the “wapreview.com” search result correctly receives wapreview.mobi, without Content Transformation of any kind being applied to the mobile site content. I have not yet tried this mobile bing search yet… Have to do it this weekend when i am free… Is it really that bad?